John here, reporting on Mark’s coverage of Sharks in Sweden. for their local bikini team. But, luckily Dolph was at his summer home to defend his motherland.Mark’s cinematographical deconstruction of the complex plot elements reveal to viewers the subtly placed undertones of capitalism and human frailty, uncovering what it truly means to be human. Read this compelling review and rethink that which you estimate as virtue versus vice…. Hello all. Mark Here. In honor of Shark Week I made up a classic bad film involving sharks. 2. Lundgren as a crazy shirtless ski instructor. 3. I tossed in sharks who have acclimated to fresh water. I made Sweden the location. The movie starts off with Baldwin’s professor still teaching his class chapter six. Some dude interupts his lecture and tells him about the shark murders in Sweden. As he leaves his class sighs with relief when he tells them to read chapter seven. 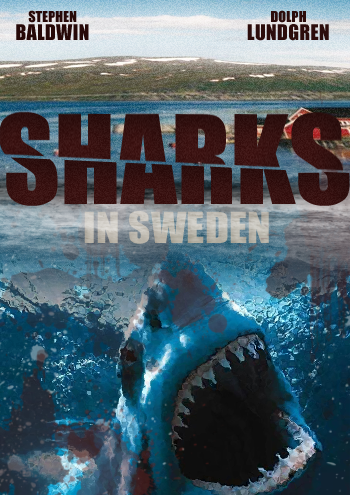 An evil Swedish general named Lars (Eric Roberts) has unleashed a fury of bad CGI sharks onto inland Sweden. He plans on taking over the world one fjord at a time. Only Baldwin, Dolph and countries without fjords can save the peace and IKEA loving Swedes. Lundgren reemerges to the small screen as an ex-commando turned ski instructor who comes back from leading his team to the state championships to find his family slaughtered at the docks (of his home on the river). Baldwin, a crazy ‘nutcase’ in the scientific community believes a new species of shark is responsible and sets out to prove it. Are these sharks natural mutations or is the government responsible for genetically engineering an uncontrollable advanced killer species? Eventually, Baldwin is kidnapped and the vengeful Dolph has to rescue him from the most violent Swedish prison ever (which happens to be on top of a mountain). Dolph manages to kill 38 guards, prisoners and corrupt cops with just ski poles. The two escape with the aid of jogging and skiing doubles. You’ve never experienced bad movie glory until you’ve watched Dolph skiing down a mountain with Stephen Baldwin on his back. Baldwin: Your shirtless back? Or watch the evil gun toting Swedish skiers behind us? Baldwin: I’m bleeding I can only do one. Dolph kills all the guys. Baldwin holds on tight while Dolph double fists shotguns and mows down the evil Swede shark lovers. The shotgun blasts cause an avalanche and pushes all of them into a local fjord. This movie never happened. I wish it did. I’m pretty certain it would be better than 99.999999% of all the bad films out there. I had a much better time writing this than actually watching a bad film. And now, I really want to watch Dolph lead a ski team to states.